After a long stretch of kitten crazy time, Flip flopped on the bed and dropped right off to sleep. I returned an hour or so later to check on the Winklers and the boy was out cold, with his teeny tiny tongue just barely sticking out. He stirred slightly, almost opened his eyes, and drifted off again. With his tiny tongue still sticking out. What a handsome man-cat he will be. Love the spots and stripes on his coat. What a handsome boy! The spots, the swirls, the white stripe down his belly, the gorgeous golden color, the feetsies sticking straight out and that tiny tongue - who could possibly pick a favorite feature of this adorable boy?!? Love him! Why, oh why!... are we so crazy for tiny kitty tougue sightings? Thanks for documenting so well, Laurie! Swirls, spots, strips-- Zonked. He's got it all. 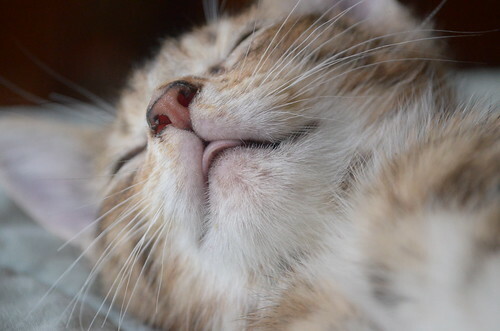 Oh my goodness, I love little kitty tongues. Such an adorable little fella. He's going to be a stunner when he gets big. Aw, hee hee! Just like my Malcolm does. Flip needs to snorgled!! Immediately!! Thank you so much for everything you do for these poor wee orphaned babies. 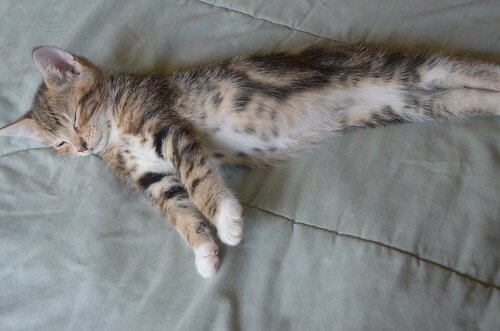 How can kittens and cats be comfortable in some of these positions they sleep in? Flip looks like he crashed mid-stretch, silly creature! Their vertebræ aren’t connected the way they are in most animals. Olympic commentator, in hushed tones: "Flip Winkler is getting ready to do his famous 'Flippin Flip Winkler Flip of Death' dive off the 10 meter platform! If he sticks this dive, he wins the Olympic gold medal! He's concentrating so hard, you can see the tip of his tongue protruding from his mouth. He's poised... he's ready.."
Flip: "Wait!! Is that the can opener I hear?? The dive will have to wait!" Collective groan from the spectators. I love it when they do that with their tongue. What cutie cat. Nice shots, you've captured a moment to remember. By the way have you tried probiotics for cats? I'm currently giving it to my cat for him to have strong tummy. I have a cat, Tawiw, and he exactly does this every time he sleeps! And he's not a kitten anymore, he's a very big tomcat. I find his sleeping positions very funny. Have you considered getting your cats toys like undercover mouse? Post pictures when they are at play. It's really fun to see cats playing. Oh that's a cool toy! I think Newton (my old cat) needs one to liven up his surroundings. That is terribly cute, but isn't that tiny little tongue rather pale? 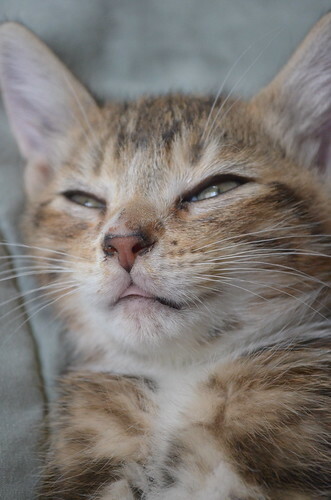 Most of the kittytongues I've seen have been a much richer, darker pink, in cats in full health. Not that you aren't feeding him or something, I'm sure! But I'm just a bit worried that he may be anaemic. Iron deficiency in cats does show in the colour of tongue and gums and pawpads, I think. You know I was thinking the same thing myself...so maybe it's not just your monitor? There's no cause for concern, he's not anaemic. Oh my god, this little kitty is so cute!